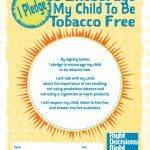 Family members can show their support for your decision to be tobacco free by filling out and signing the Parent and Guardian Pledge. Ready to be tobacco free? 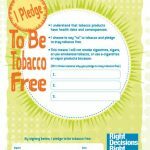 Show your support for what you stand for by filling out and signing the Student Pledge to be tobacco free.